-create groups by adding a hash tag at the end of the player note eg. "enjoys hallways #story tellers"
I fixed the broken things in 7.1. Awesome, thanks for the fix ! Made change foe the new battle.net API changes, this addon should work now. Really like the addon! 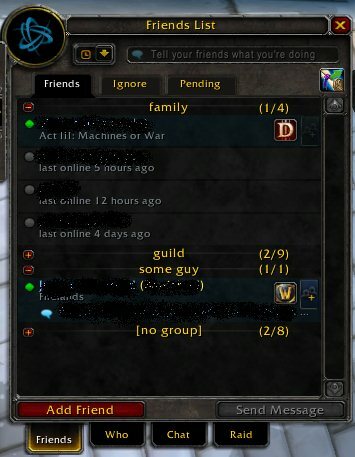 Would it be possible to add an option that allows you to expand/collapse all offline members of the group? So it would show all online members of the group first, followed by a collapsable list of members who are offline. I am most interested in who is online, and rarely have a need to view the members that are offline. Thanks! Great work! This addon is about perfect and I'll be trying it out tonight with an OpenRaid run. However, a different implementation of creating groups would be nice. I don't like the idea of hijacking the notes to create groups. Maybe a simple options area could be added to manually set the groups instead? Or even simpler, seeing as adding groups wouldn't be too common maybe instead just a slash command.